· The text of the novel as it first appeared (serialized in 1884–85), with explanatory annotations by Paul R. Petrie. · A wealth of contextual materials, including maps of contemporary Boston, correspondence about the novel’s composition, excerpts from Howells’s essays on literary realism, and readings carefully chosen in order to help students understand American society during the Gilded Age. 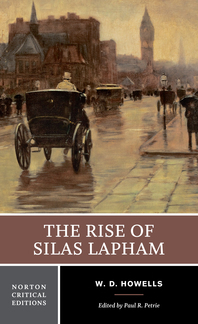 · Over a dozen reviews of the novel and letters from Howells’s early readers. · Twelve modern essays exploring the novel’s style and themes. · A Chronology of Howells’s life and a Selected Bibliography. Several images in various media help paint a fuller picture of Howells's time and place. A rich selection of correspondence to and from Howells, some material from his notebooks, and a section detailing his changes to two specific controversial passages from the novel, give a sense of the writer at work.